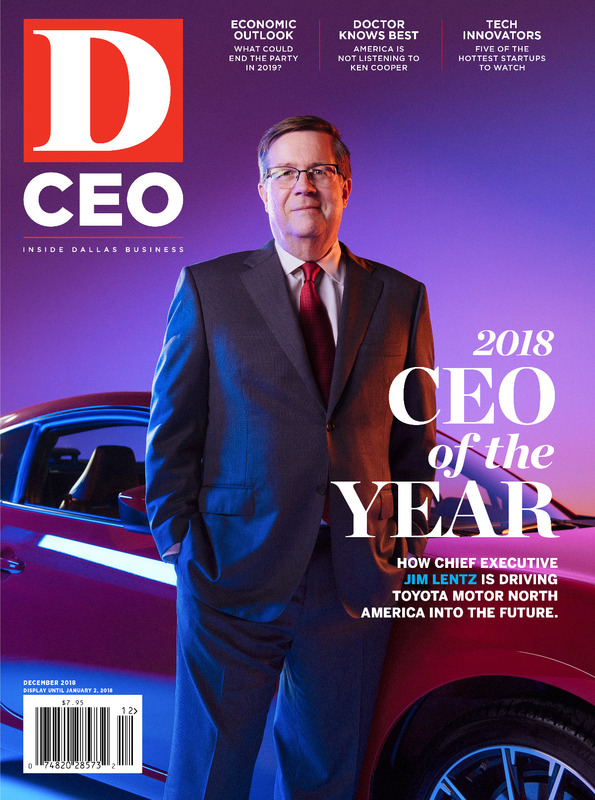 By Jason Heid | 5 months ago D CEO’s top executive of the year oversaw the company’s move to Plano, and he’s fundamentally altering the way Toyota does business. We’re Approaching 10 Years of Economic Upswing. Should Dallas Expect a Slowdown? By Thomas Korosec | 4 months ago "Statistically, we're getting into unknown territory," says one economist here. How long can it last? By Will Maddox | 4 months ago It’s more bodega than big-box grocer, but the central business district finally has a food stop. By Nicholas Sakelaris | 4 months ago These five up-and-comers are leveraging technology to transform their industries. By D CEO | 4 months ago The CEO of ExxonMobil Corp. worked at a Navy warehouse as a teenager. By Dr. Shawn Parsley as told to Will Maddox | 4 months ago The head of the Texas Health Physicians Group talks about how the group developed a brand. By Brandon Call | 5 months ago You have to climb winding stairs to the top of a bell tower to reach the office of the Blackard Global CEO. By Art Stricklin | 5 months ago The PGA of America is on the way, but Barney Adams, Adams Golf founder, and Christopher Griffin, of startup P53, are already doing big things for the hackers among us. By Christine Perez | 5 months ago Snacking is evolving, but President and COO Vivek Sankaran has Plano-based Frito-Lay evolving with it. By D CEO | 5 months ago She founded and runs Bed Rest Concierge, a luxury maternity brand. And she looks good doing it. By Botond Laszlo as told to Brandon J. Call | 5 months ago The Founder of Marvelous Home Makeovers discusses his childhood in Romania and coming to the U.S. with $48 to his name. By Christine Perez | 5 months ago Why the real estate investor is betting big on downtown Dallas. By Brandon Call | 5 months ago Fite, president and CEO of Century 21 Judge Fite Co., and his wife have done their fair share of traveling. By Jeremiah Jensen | 5 months ago The founder and CEO of Options Real Estate says that it's stakeholders and small businesses that struggling communities really need.